Global climate change is causing Antarctic ice shelves to shrink and split apart, yielding thousands of free-drifting icebergs in the nearby Weddell Sea. According to a new study in this week’s journal Science these floating islands of ice – some as large as a dozen miles across – are having a major impact on the ecology of the ocean around them, serving as “hotspots” for ocean life, with thriving communities of seabirds above and a web of phytoplankton, krill, and fish below. The icebergs hold trapped terrestrial material, which they release far out at sea as they melt. 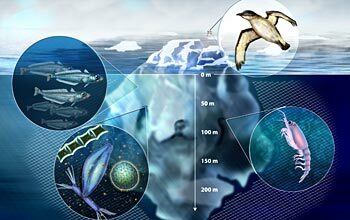 The researchers discovered that this process produces a “halo effect” with significantly increased phytoplankton, krill and seabirds out to a radius of more than two miles around the icebergs. They may also play a surprising role in global climate change. “One important consequence of the increased biological productivity is that free-floating icebergs can serve as a route for carbon dioxide drawdown and sequestration of particulate carbon as it sinks into the deep sea,” said oceanographer Ken Smith of the Monterey Bay Aquarium Research Institute (MBARI), first author and principal investigator for the research. “While the melting of Antarctic ice shelves is contributing to rising sea levels and other climate change dynamics in complex ways, this additional role of removing carbon from the atmosphere may have implications for global climate models that need to be further studied,” added Smith. To understand the icebergs’ complex impacts, the multidisciplinary team of researchers carried out the most comprehensive study ever done of individual icebergs and their immediate environment, taking a wide array of measurements – physical, biological and chemical, and using satellite images provided by NASA. Using SDSC-developed technologies, Helly collected the data using the SIOExplorer-in-a-Box digital library system (http://SIOExplorer.ucsd.edu) and then stored the information in collections at SDSC for access and analysis by scientists now and in the future. Just getting to the icebergs was a challenge. First the scientists used satellite images to select two icebergs to study in detail. Then they sailed aboard the Antarctic research vessel Laurence M. Gould to reach their targets in the remote Weddell Sea, an arm of the Southern Atlantic Ocean that cuts into the Antarctic continent southeast of Cape Horn. The icebergs in the study were up to a dozen miles long and more than 120 feet high, with one extending nearly 1,000 feet into the depths. Despite the risks of getting close to these mountains of ice – which can shed huge pieces or overturn without warning – the scientists began their shipboard sampling mere hundreds of feet from the icebergs and continued out to a distance of some five miles, where the icebergs’ influence was no longer detectable. “Phytoplankton around the icebergs was enriched with large diatom cells, known for their role in productive systems such as upwelling areas of the west coast of the U.S. or ice-edge communities in polar oceans. As diatoms are the preferred food for krill, we expect the changes in phytoplankton community composition to favor grazing as a key biological process involved in carbon sequestration around free-floating icebergs,” said oceanographer Maria Vernet from Scripps Institution of Oceanography at UC San Diego, one of the members of the research team. Based on their new understanding of the impacts of the icebergs and their growing numbers -- the researchers counted close to 1,000 in satellite images of some 4,300 square miles of ocean -- the scientists estimate that overall the icebergs are raising the biological productivity of nearly 40 percent of the Weddell Sea’s area. In addition to Smith, Robison, Vernet and Helly, the study’s authors include Henry Ruhl of MBARI, Ronald Kaufmann of the University of San Diego, Timothy Shaw and Benjamin Twining of the University of South Carolina.